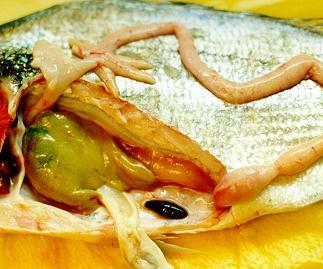 Emaciated young caged bream with distended abdominal walls (a rather rare finding) due to chronic enteromyxosis. Sharp snout sea bream suffering from enteromyxosis, showing skin discolouration around the dorsal area and liver inflammation/congestion. It is the most vulnerable farmed species to this endoparasite. 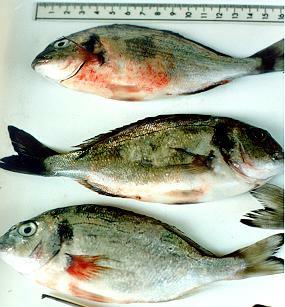 Sea bream infested with Enteromyxum leei. Skin discolouration, mainly on the dorsal area and the body flanks and skin haemorrhagic inflammation due to secondary bacterial infections comprise the external findings. The gills and the liver are severely congested. The mucosa of the branchial cavity is inflamed and haemorrhagic, the gut is inflamed and locally distended and the gall bladder is moderately distended/elongated and filled with dark brownish bile. Numerous spores and sporogonic stages of the parasite are found in the gut content and the bile (fresh smears). 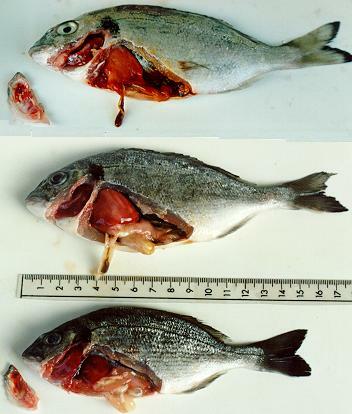 Necropsy findings of sea bream brood-fish found moribund in their tanks due to enteromyxosis. The diagnosis was confirmed by microscopic examination of gut contents and bile, where the parasite (numerous spores and sporogonic stages) was abundant. The water was pumped from the sea, filtered through a 300μm sand filter and circulated to the brood-stock tanks. Above: The intestine is locally distended and filled with transparent fluid, but in the main is inflamed and filled with a creamy mucous content. Below: The intestine and pyloric cecae are filled with creamy mucus. The stomach is empty. The gall bladder is moderately swollen and the liver is degenerate with a greenish tinge, evident of bile stagnation in the affected bile ducts.